No two faces are the same — and we don’t just mean facial features. Each of our faces has a unique chemical composition that gives us (for better or worse) our skin type. Many of us suffer from dry, flaky skin. When this is the case, it can be a delicate balancing act between applying moisturizer and running the risk of becoming too oily, or finding that your moisturizer makes little or no difference. While, for others, oily skin has been something they’ve dealt with for years. Few of us love our skin all of the time, which is why these cosmetic dermatology treatments are more than skin deep; helping our patients love their skin and their appearance is one of the great joys we share at Advanced Dermatology Care. Curious about how microneedling or facials can help you achieve the type of skin you’ve always wanted? Read on to learn more. Also known as collagen induction therapy (CIT), microneedling is a cosmetic dermatology procedure that involves gently puncturing the skin with tiny, sterile needles. This creates a wound response in the face, allowing the creation of new collagen and elastin fibers to generate healthier, newer skin. While this may sound unpleasant, Advanced Dermatology Care utilizes a handheld device that slides across the skin, making it one of the more pleasant micro needling procedures available. The final result is firmer, smoother, and younger-looking skin that you’ve always wanted. 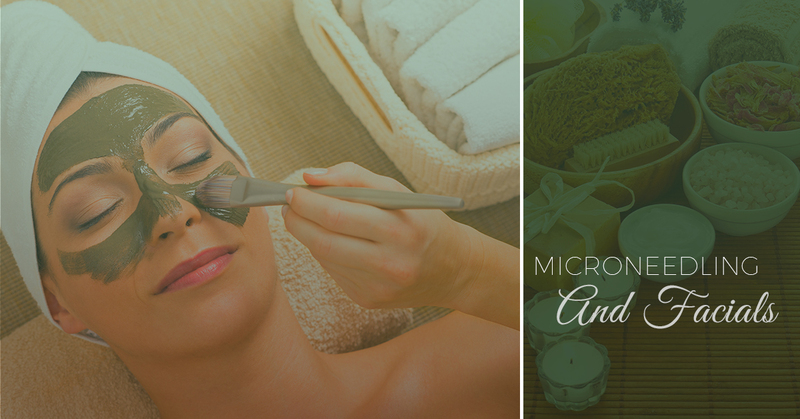 But microneedling isn’t just for those who want younger-looking skin; microneedling works wonders for those who are looking to treat hyperpigmentation, hypopigmentation, and acne scars. For many, a few sessions are enough. But, for some, treatments should come in a series and be spaced out between six and eight weeks. Ah, facials. When we think of facials, we often find ourselves in a spa with robes, candles, and maybe a drink not far away. While spa days are an excellent way to relax, not everyone has the time or money to spend their days at the spa. Advanced Dermatology Care understands this, and offers multiple facial options to treat numerous conditions. Many choose our deep pore-cleansing option, as it is great for clearing out congested pores. This is one of our more popular options among teenagers struggling with ance as it helps reduce oil production without drying out the skin. For those whose skin requires a gentler touch, our Sensitive Skin treatment calms and soothes the skin with its Vitamin C Firming Masque. This masque helps with inflammation associated with rosacea and similar skin types. But, if you’re suffering from prolonged or problematic acne, our Clinical Acne Treatment is what you’re looking for. This treatment utilizes a calming masque and lymphatic drainage to take a coupled approach to combatting acne. If any of these facial options sound like they could benefit your skin, don’t hesitate to reach out to us today to learn more or to schedule your next appointment.